Congratulations to TreeTop Challenge for achieving Nature Tourism Certification. Located in scenic North Tamborine, the TreeTop Challenge is fun, challenging and appeals to the daredevil in everyone! 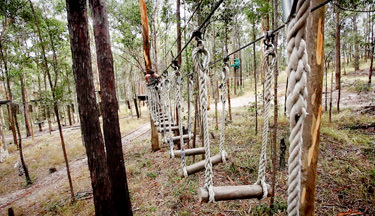 With 85 challenges over 5 courses, spanning through 9 acres of natural bushland combining rope and wire challenges. Hang about in the trees, climb the ladders, balance on the suspended bridges and jump on 12 flying foxes! All safety equipment (harness & gloves) is supplied and participants are fully instructed on its usage before beginning the course. Qualified supervisors guide adventurers to ensure safety. For more information on TreeTop Challenge, click here. Congratulations to Narrows Escape Rainforest Retreat for achieving Advanced Ecotourism Certification. Narrows Escape is a boutique 4½ star rated luxury resort comprising six fully self-contained secluded cottages nestled in 7 acres of rainforest in the Blackall Range, near Lake Baroon, Montville, adjacent to Kondalilla National Park in Queensland’s Sunshine Coast hinterland. The facility is aimed at the luxury adult couples market, providing an exclusive rainforest retreat experience. Located at the start of the Sunshine Coast Hinterland Great Walk, Narrows Escape is attractive to visitors from Queensland, interstate and internationally. For more information on Narrows Escape Rainforest Retreat, click here. oceanfront acres, with private sandy beaches, dramatic clifftop walks and panoramic views to Kangaroo Island, this gorgeous architect-designed beach house is the perfect place to unwind in comfort and style. Guests (both two and four-legged) can explore pristine areas of mallee scrub filled with spring flowers, birds and kangaroos or stroll along the clifftops to look for whales and visit Yondah’s resident family of fur seals. Or they can simply bask in the sun on a beautiful golden beach of their very own. For more information on Yondah Beach House, click here. Byron Bay Adventure Tours offers tours in and around Byron Bay, NSW. As a locally owned and operated business, they offer visitors a truly unique experience specialising in Byron Bay and hinterland tours. Their Byron tours can be guided in English or German and their local guides only take small groups to ensure guests have a highly personalised Byron Bay tour experience. Byron tours include a tour guide, all meals and snacks and all camping gear for any overnight tours. For more information on Byron Bay Adventure Tours, click here. Challenge you to rethink your business model for a profitable and sustainable future. Provide you with business tips that you can action right now across marketing, partnerships and investment. Equip you to motivate your team to do epic work. Highlight results from the most current tourism research and trends. Tourism operators large and small will benefit from the diverse two day program, including the chance to connect with tourism operators, industry leaders and decision makers from across Victoria, and beyond.Be part of creating a stronger tourism industry for the whole country! The workshop will be hosted by Natural Resources SA Arid Lands & Flinders Ranges National Landscapes Committee. The workshop will be delivered by experienced, skilled and knowledgeable presenters from Ecotourism Australia & South Australia Tourism Industry Council. Attendees of the workshop are provided with an exclusive offer to have their certification application fee paid for by Natural Resources SA Arid Lands should they apply for certification by Friday 30th May, 2014. Please complete an Expression of Interest form should you wish to participate and return it to Ecotourism Australia via email or fax. Cairns Turtle Rehabilitation Centre is a not for profit organisation dedicated to the rehabilitation of sick and injured turtles. The Turtle Rehabilitation Centre, located on Fitzroy Island, is a public education facility which enables visitors to learn about threats facing turtles and the turtle patient’s journey to recovery and release back into the ocean. The Centre offers daily Interpretive Tours with entrance by donation. Cairns Turtle Rehabilitation Centre is only able to continue its work due to the support received from local businesses. Tim North and Jeff Cameron-Smith of Reef Magic Cruises were on hand to introduce “Magic”, a stranded Green Turtle initially rescued by Mission Beach Charters and now sponsored as a patient by Reef Magic Cruises. Rod Hillman was delighted to see Eco Certified Tourism Operators directly contributing to the protection of turtles via sponsorship, to provide for the food bill of turtle patients.